San Diego is a lively and charmingly photogenic City, kissed by the sun and caressed by gentle ocean breezes; it offers many distinctive and scenic locations for outstanding engagement photography. A relaxing a stress-free engagement photography session can be had by starting out at Spanish Landing Park, a historical location where you'll find delightful structures and gorgeous views of the marina and the city of San Diego in the background. Take a walk on the tranquil beach, pose by the domed cupola and let the love you feel for each other come through to be captured in photographs you'll cherish forever. For a different perspective and even more amazing views of the City, head up N Harbor Drive to Shelter Island Shoreline Park, where you'll find sweeping panoramic opportunities, a quaint Pagoda, and a swooping, modern gazebo providing unique backdrops for your photographer to incorporate into fascinating and romantic images. Bright and cheery shots can be had relaxing on the lush green grass as the palms rustle in the breeze. From here head a few minutes up to the coast where you'll find charming and quirky Ocean Beach ' a destination that offers many delightful urban and seaside photo opportunities. Take a relaxed stroll down Newport Avenue and Voltaire St., lined with inviting antique stores, cafes and colorful local businesses as your photographer captures playful and spontaneous moments while you explore this happy little town within the City. And if you plan your session around sunset and you'll be rewarded with spectacular settings and golden light on the beautiful beach and along the pier. For a wonderful engagement photo session in a location that will take you back in time head to Old Town San Diego, where you'll find countless settings that you can claim as your own. If you can, make plans to go during the week as weekends can be a bit frenetic. Start your session at La Casa de Estudillo, a lovely adobe mansion that surrounds a peaceful central courtyard. Here you'll be able to pose for classic and intimate photos in and around this historic and graceful house. At the Casa Machado y Stewart another beautiful courtyard awaits with plenty of romantic settings for intimate portraiture; here too the quaint 19th century architecture provides a timeless feeling that is so unique to this wonderful part of the City. You'll definitely want to take a walk down to Heritage Park where stately Victorians provide a vibrant counterpoint to the early California ranch-style architecture. Then just stroll about as you find opportunities for spontaneous photos up and down the streets of what was the first Spanish settlement in California. Wrap up your engagement photo session with a toast to your future at the Tequila Museum on San Diego Avenue ' and don't forget to get some photos of the two of you on the elegant curved staircase inside. 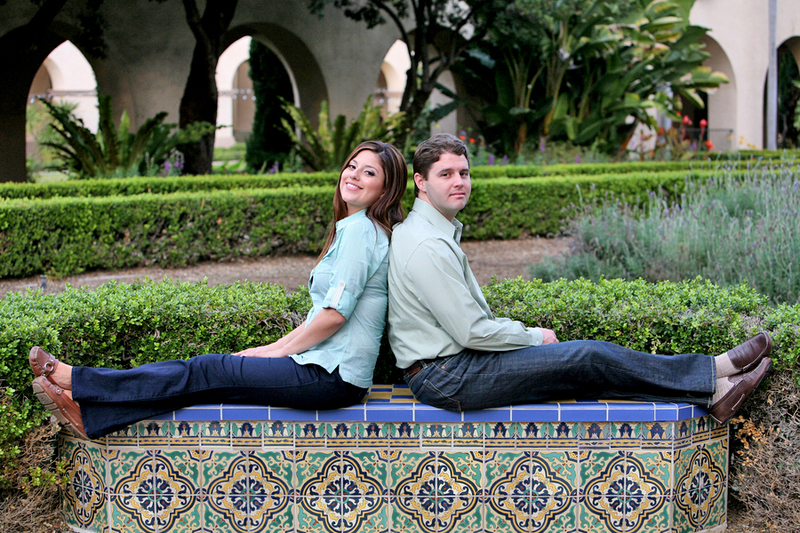 San Diego State University offers many interesting locations for lovely and intriguing engagement photographs. Start at the Campanile Walkway and stroll hand in hand down to the '100 Years, 100 Stones' monument for interesting and playful photos ' while you're here make sure to stand in the center and declare your love to your fianc'e! Then head down to the Hardy Memorial Tower, where if you time it just right you'll hear the lovely 50-bell symphonic carillon chime and you'll find charming settings for sweet photos of the two of you in the lush grounds that surround it. Carry on with your leisurely walk to Scripps Cottage and Park where lovely shade trees and a tranquil fish and turtle pond invite you to relax and capture intimate images in this marvelously photogenic location. You can wrap up your session at the Mediterranean Garden and pose by the burbling tiled fountain and take in the dazzling array of Mediterranean flora that surrounds you. The grounds of the University of California San Diego offer a different and wide variety of photo opportunities ' from peaceful park-like settings to vibrant modern architecture and dazzling sculptures. On the south lawn of Galbraith Hall you'll find a fascinating installation titled 'Stonehenge' where thoughtful and romantic poses can be juxtaposed with playful and spontaneous moments. Head over to the 'Sun God' sculpture and indulge in serious fun as you pose by this famous and very colorful landmark and on the lush lawn that surrounds it. The breezeway between Bonner Hall and Mayer Hall is an angular architectural symphony that makes for a fascinating setting to capture interesting and intimate images. Next, head to the Eucalyptus grove where you'll find a forest of tall trees and warm dappled light to frame reflective and tranquil images. Wrap up your session at the courtyard of the Jacobs School of Engineering, where you'll find a playful rock sculpture called 'Bear' and numerous opportunities for relaxed photos in a lovely outdoor setting. The campus of San Diego University is a very delightful location where Spanish renaissance architecture and lovely views of the Bay can be had from the gorgeous manicured landscapes. The grounds before the School of Nursing are a lovely place to start by shooting intimate romantic photos. Head to the Jenny Craig Pavilion where you'll find a gorgeous fountain and a curved staircase that provide great backdrops for lovely engagement session photography. Then if you have the time, simply stroll around this charming campus for you're sure to find countless opportunities for graceful and timeless settings to capture this special moment in time.